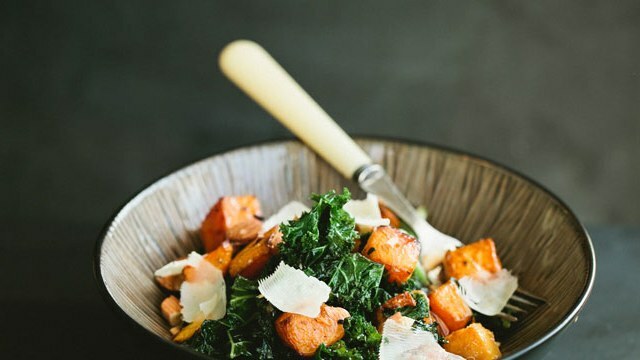 This Kale Salad with Butternut Squash and Almonds from Bon Appetit is simple and simply delicious. The sweet roasted squash plays on the saltiness of the Parmesan and the nutty crunch of almonds. We love this with a roast chicken or with the addition of some barley or farro to give it a little more main dish heft! Preheat oven to 425°. Line a baking sheet with foil. Whisk 5 Tbsp. oil, vinegar, shallot, and Dijon mustard in a small bowl. Season to taste with salt and pepper. Set aside. Combine squash and 2 Tbsp. oil in a medium bowl and toss to combine; season with salt and pepper. Transfer squash to a prepared baking sheet and roast, turning occasionally, until squash is tender and lightly golden, about 20 minutes. Let cool slightly.